Cholecystitis is inflammation of the gallbladder—it is what happens when the gallbladder becomes inflamed. The gallbladder is a vaguely pear-shaped organ that sits next to the liver and is responsible for storing the digestive fluid (bile) that your small intestine uses to break down fats in food. Bile is produced by the liver and flows into the gallbladder, where it is held. Eating food triggers its release through the bile ducts. In addition to making digestion more difficult, cholecystitis is also classified as a medical emergency and needs to be treated as soon as possible in order to avoid a rupture. The gallbladder is an important part of your body and taking some time to learn about cholecystitis can go a long way to keeping this unsung hero of the digestive tract in good health. Injury: The gallbladder’s position in the body makes it less vulnerable to being injured than other organs but it can be done, usually from a car accident or similar trauma. The initial injury itself can trigger cholecystitis as can any scar tissue that forms after and continues to irritate the gallbladder. Injury can also result in the bile duct becoming “kinked” or scarred, leading to a build up of bile. Illness: Although not the most common cause, the gallbladder can become infected should bacteria manage to migrate into it through the liver or blood stream. Additionally, advanced HIV or diabetes has been known to trigger the swelling. Gallstones: Gallstones are one of the leading causes of cholecystitis; they are the result of bile that has collected and hardened into a firm lump. There is no known cause of gallstones, but the current theories involve the liver producing bile with too much cholesterol or bilirubin. If the gallbladder isn’t able to empty itself properly (such as from scarring, injury, or obstruction), then bile can also build up and form stones. Gallstones can become as large as a golf ball and are able to block the bile duct either partially or fully, leading to cholecystitis. Tumor: As tumors can form anywhere in the body, it is possible for one to grow within the gallbladder or bile duct. In these cases, cholecystitis can arise either from a response to the tumor itself or because the growth is blocking the bile duct. Cholecystitis can either be a singular, acute condition or a more chronic problem characterized by recurrent attacks. In the event of chronic cholecystitis, the repeated inflammation and swelling will cause the walls of the gallbladder to thicken. This will impede the organ’s ability to store and release bile, furthering the problem. Pain: Cholecystitis results in severe pain around the upper-right area of the abdomen. The sensation can be a dull cramp or excruciatingly sharp and can feel like it is radiating up to your back or below the right shoulder blade. Tenderness: The abdomen will be tender and sensitive to being touched. Flu-like symptoms: Cholecystitis is often accompanied by fever, chills, nausea, and vomiting. Stool changes: The color and nature of your bowel movements is partially influenced by its bile and fat content. Cholecystitis usually results in bile not being able to enter the digestive tract, resulting in gray, loose stools. Jaundice: The inability to dispose of bile properly can lead to a build up of bilirubin in the body. This causes jaundice, which is when your skin and the whites of your eyes turn yellow. Jaundice and gray stools are the symptoms that are most suggestive of liver or gallbladder problems. Even chronic cases of cholecystitis are considered medical emergencies so you will likely end up hospitalized during the treatment process. Treatment methods revolve around keeping the gallbladder stable to avoid ruptures while trying to treat the root cause of the inflammation. The process should take around two days on average. Fasting: As mentioned above, cholecystitis is aggravated by eating or drinking. Consequently, fasting is called for as a means of easing stress on the gallbladder during the treatment process. In a hospital, you will be provided with a hydration and nutrient drip to compensate. Drugs: Anti-inflammatory drugs and pain medications are the order of the day when handling cholecystitis. If the inflammation is due to an infection, you will be given treatment for that as well. 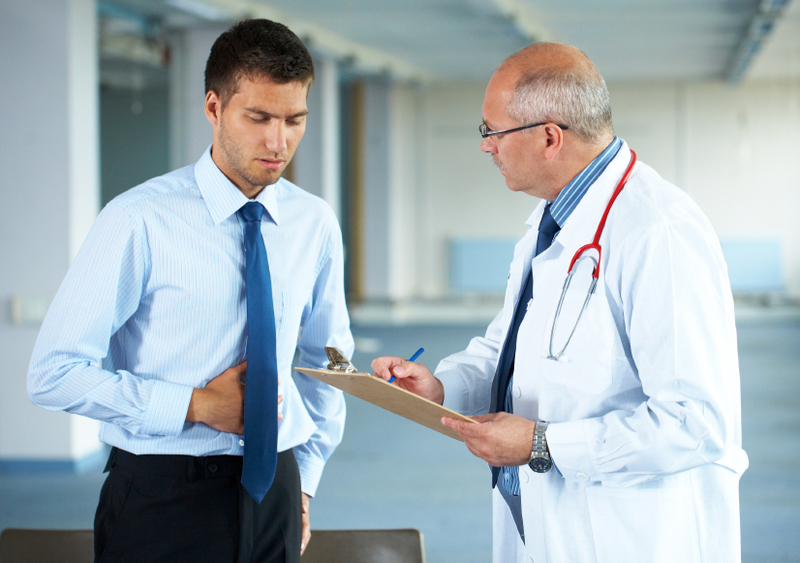 In the event of gallstones, medication may be administered to try and make them dissolve. Surgery: Surgical intervention can be required in order to repair any damage that the gallbladder has suffered or to remove gallstones or tumors that are causing an obstruction. In the event of a ruptured gallbladder or a chronic case of cholecystitis, the entire organ will need to be removed. Maintain a good weight: Being overweight is a known risk factor for gallstones so it’s important to maintain a healthy level. When trying to lose weight, the best options are a balance of diet and exercise that suits your lifestyle. Mind your weight rate: Rapidly gaining or losing weight can make you more vulnerable to gallstones. Generally speaking, a weight fluctuation of up to two pounds per week is considered safe without increasing your risk. Mind your diet: As mentioned above, one of the theories about gallstones is that they can be caused by too much cholesterol in the bile. Although the link between dietary cholesterol and gallstones isn’t as strong as with weight, it is possible that reducing the cholesterol you consume can help ease your risk. “Cholecystitis,” Mayo Clinic web site, August 28, 2014; http://www.mayoclinic.org/diseases-conditions/cholecystitis/basics/definition/con-20034277. Pietrangelo, A., “Chronic Cholecystitis,” Healthline web site, October 5, 2015; http://www.healthline.com/health/chronic-cholecystitis#Overview1.